Disabled Living entered into a partnership with Salford City Council and relocated the Disabled Living Centre to Worsley. The Centre, opened by Sir Alex Ferguson in 2012 is a purpose designed facility which sits alongside Salford City Council’s Equipment Store at Burrows House on Wardley Industrial Estate. Our staff work alongside Salford’s occupational therapy and sensory services. It is envisaged, the people of Salford will use this excellent resource to find out more about equipment that can support them to remain independent, stop trips and falls or just make life easier. Contact us, we are here to help! We have a team of health and social care professionals including occupational therapists, continence nurses and moving and handling specialist, who, initially through our helpline can provide advice, information and signposting. In addition, we can offer you an appointment to view and try a wide range of equipment within the Centre with one of our team. 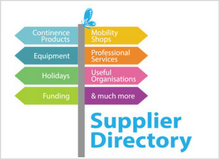 We can provide information about organisations whom may be able to fund or supply equipment, signpost you in the direction of additional support or you may choose to browse our Supplier Directory. For your convenience, at the Disabled Living Centre we also have an Ableworld store which sells a wide range of equipment including stairlifts, walkers, scooters, wheelchairs, continence products and smaller aids. The experienced team of staff and engineers has extensive knowledge of the equipment. The store can provide engineering services on site or in the comfort of your own home, within a 30 mile radius of the store. Ableworld will also provide assessments and quotes for stairlifts. Anybody can visit the store, you don’t need an appointment or have to see a member of the Disabled Living team. All of the Ableworld stores are built on good ethics and a company policy that they will not sell any aid or stairlift which isn’t suited to the user. Ableworld will only sell a mobility aid which will increase someone’s quality of life. Ableworld also offer a free delivery service within the local area. Paul and the team will be delighted to see you, just pop in and have a look around.